Crafting for love and sanity. Since the new year I have started quilting. I started out by cutting and piecing the bricks for a full sized quilt based on this one. It will be full of some wonderfully bright batiks I picked up from Keepsake Quilting with my sisters. 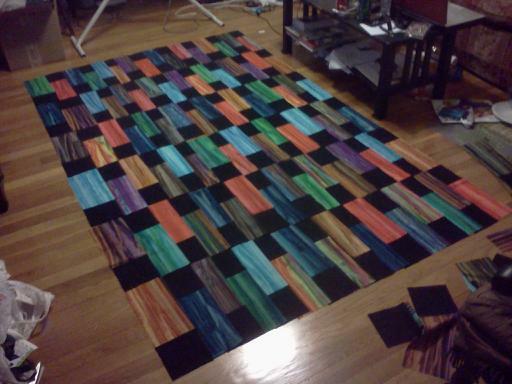 I decided not to assemble the top, however, because I was afraid it would be far too unwieldy to quilt on my own. I have since finished a mini-quilt based on this tutorial where I got in some practice with straight-line quilting. I quilted and bound the whole thing during Winter Storm Nemo after school was cancelled for the day. I’ve got the bug now, though. I decided to pull out my bricks last night and lay out the design. Now I’m piecing the bricks into blocks of four bricks which I will connect up after. Unfortunately, part of the reason I stopped the piecing before was that I did not have a 1/4 inch foot, so I eyeballed the piecing of the bricks (which I’m not sure were cut all that well to begin with). A lot of them are off by up to 1/8 inch. I’m hoping that constructing the blocks in this way, unlike the tutorial where they are assembled in strips will help me to get a more even quilt. The batiks are hiding the abnormalities a bit, but I would like to have the corners as tight as possible. I’ll post pictures later. Unfortunately, I left my camera at my parents’ house over Christmas and will not be able to get it back until the weekend. The Ashton Shawlette got blocked today! It's got a 52" wingspan and is 26" tall. Working on my quilting skills! Working away on Heather's Quilt.